The Samsung's S5PV210 ARM Cortex-A8 is world's first Cortex-A8 based application processor in 45nm LP process that runs at 1GHz. It provides state-of-the-art 3D performance and a rich collection of multi-media support while achieving the lowest power consumption and integrates a 1080p full HD codec engine that supports 30fps full HD video playback and recording. The S5PV210 is aimed at portable computing devices such as netbooks that demand high performance and design flexibility. Embest DevKit7000 Evaluation Board is a high-performance development board based on the Samsung S5PV210 processor, with onboard 512MByte DDR2 RAM and 512MByte NAND Flash. It takes full features of this application processor and the board exposes many other hardware interfaces including 4 UARTs, 4 USB Host and 1 USB OTG, Ethernet, TF card, Camera, SD/MMC, SPI, I2C, ADC, PWM and more over. It can support 1080p HDMI high-definition video display and TFT LCD display with touch screen running popular Google Android system. Embest DevKit7000 Evaluation Kit includes the DevKit7000 evaluation board with 7inch LCD and touch screen and all necessary accessories. 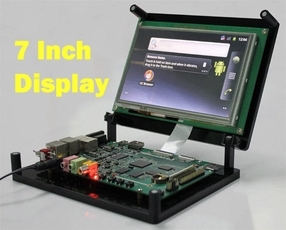 The DevKit7000 board, 7 inch LCD and touch screen will be fixed on a specially designed mounting bracker for delivery which is good for protecting the products, and would also help users start their development conveniently. The device is preloaded with Android 2.3 OS in NAND flash but it can also boot from TF card following Embest instructions. It can also support for WinCE 6.0 OS. Embest provides user manual, schematic drawing, datasheet documents and software BSP to help customers better understand and use the kit.